Unusual Punishment, the featured title in the 2016 Spring catalog of the Washington State University Press, is available in bookstores and online. If it’s not in your favorite bookstore, ask for it and they can get it for you. You can also order directly from the publisher by calling 1-800-354-7360 or by visiting their website at WSUPress.wsu.edu. Chris, this is an amazing website that really makes one appreciate how far we have come since the 70’s. 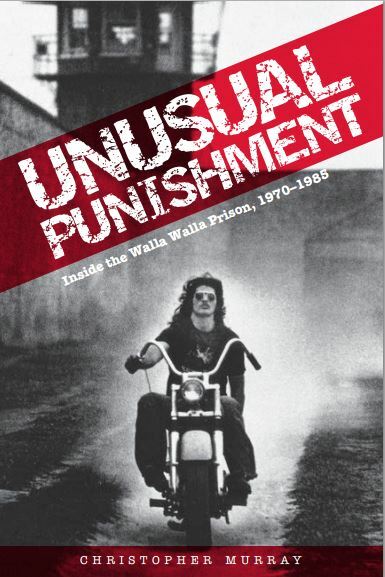 In my opinion this is a must read for any Prisons Director and Superintendent of WSP, so I passed it along to Don: ) I can’t wait to read the book because the stories in it are the stories I grew up on when I went to work at WSP in the 80’s. It was those stories and experiences that define the Pen for the next couple of decades and in some ways still do today. In the last decade there has been some significant change making it a better place for staff and offenders but the difference in this change compared to that of the 70’s was a balanced approach informed by those experiences. Nice job and thanks for bring these stories to all of us! Wow. In 1975, I was a young CO at Walla Walla. I had no idea what I was in for. I knew a great many of the folks mentioned in your audio and on the website. I transferred to Shelton after a year, but then returned to assist with the riots and then retuned every week for four years on the prison bus. I left DOC as a Lt. in 1986 to pursue a career as a police officer. I am now a Deputy Chief . Great job. Can’t wait to see the book. If you need anything, send me an email.